One of the most common ideas associated with clinical antibiotic resistance is the fitness factor. I have in multiple posts talking about this idea in my previous posts. The idea is that when a bacteria acquired genes for antibiotic resistance there is a fitness cost associated with it. Until and unless there is this constant antibiotic threat to the bacteria, it is not so useful for the bacteria to keep resistance genes, since there is a cost associated with maintaining that gene. There are several experiments that showed at least for some drugs that if you mix a sensitive and resistant phenotype of a given organism and allow it grow together on an antibiotic free condition, the sensitive strain tends to dominate easily. The idea is all fine and good in laboratory conditions. 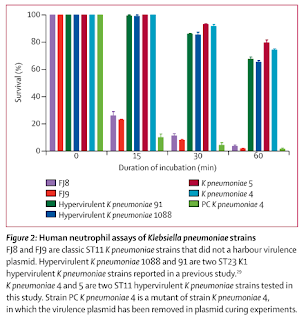 In a series of 5 hospital acquired pneumoniae infection (All fatal) following surgery in a Chinese hospital, a Klebsiella pneuomoniae ST11 strain has been isolated which is not only an MDR (Multi drug resistant) but also a hypervirulent strain. What was really interesting to me was that they did a string test, human neutrophil assay and a wax moth virulence test to establish its hypervirulence status. These tests are really valuable models and so I think I should explain these in a little bit of detail. String test (Don't confuse this with the string test done to identify Vibrio cholerae), is a kind of qualitative marker used to test the hypermucoviscous phenotype seen in Klebsiella pneumoniae which are an indicator or hypervirulence. Basically, you grow the organism on a 5% sheep blood agar at 37°C overnight. The string test is positive when a bacteriology inoculation loop or needle is able to generate a viscous string > 5 mm in length by stretching bacterial colonies on an agar plate. See Photo 1. In this paper, authors reported that the string test was positive for all five strains, each producing strings longer than 20 mm. 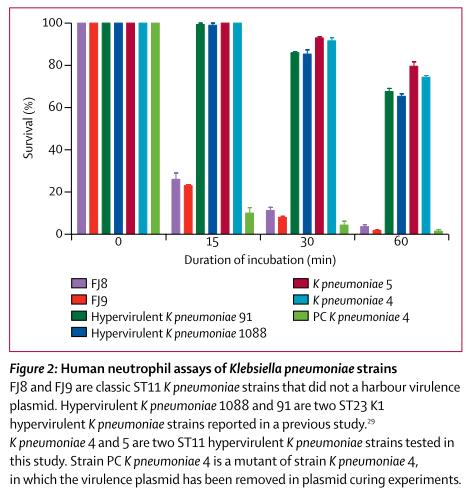 Fig 2: Neutrophil Survival of K pneumoniae strains. Neutrophil assay is a test to see how good the bacteria resist killing by the neutrophil in laboratory conditions. In principle, neutrophils obtained from healthy volunteers. A well containing 10⁶ neutrophils and 10⁶ CFU of opsonised K pneumoniae in RPMI/H medium is prepared at 37°C. A small sample is taken at intervals and bacteria is plated on Luria broth agar. Survival is calculated as a percentage of CFUs with reference to controls. For the study, K pneumoniae 4 and 5 (representative strains), two classic ST11 strains FJ8 and FJ9 (known to be not hypervirulent strains) and two known K1 hypervirulent K pneumoniae strains 1088 and 91 along with PC K pneumoniae which was removed for its virulence plasmid were studied. Fig 1 shows the results. You can clearly see that the strains 4 and 5 were really evading the neutrophil killing. Fig 2: Virulence potential of isolated strains. Another test for virulence was done using Galleria mellonella or honeycomb moth. Basically, the bacteria are incubated with the larvae and you look for the ability of the larva to survive. 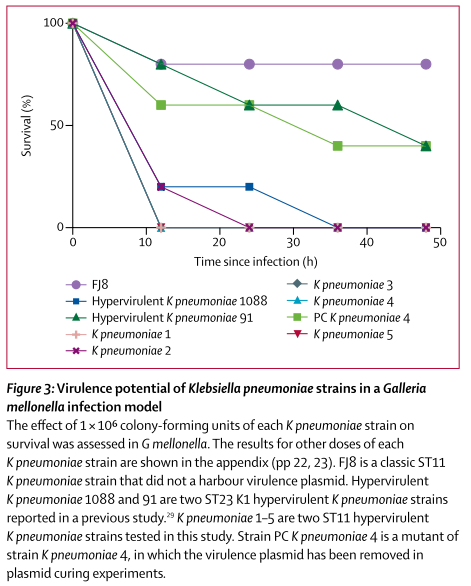 For this study, cultures of K pneumoniae strains were washed with PBS and larva was infected with the bacteria and survival rate of the larvae was studied. See Fig 2. The study does provide a compelling evidence that the strains they isolated were hypervirulent. Yes, they were also MDR strains but most of the K pneumoniae strains isolated globally are MDRs. But mind you they are not super bugs. I wasn't sure if these strains were resistant to drugs like Colistin and from the data they appear tigecycline sensitive. I take this study as a proof that ST11 type which is a common circulating type in Asia is capable of hypervirulence. They have a 170 kbp plasmid (pVir- CR-HvKP4) which makes it hypervirulent, multidrug resistant, and transmissible. 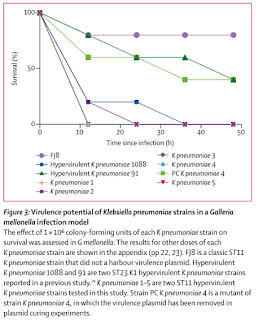 Considering so many people are dying from Klebsiella pneumoniae infections it may be worthwhile to test how many percentages of it is actually hypervirulent.